Today, while listening to something new, I actually had to turn the bass down. Pathetic, I know. My only consolation is that it'll all be over soon. It can't be long now... till they turn me into Soylent Green. And then finally, after taking so much from the community, I'll be able to give something back. "Soon they'll be breeding us like cattle! You've got to warn everyone and tell them! Soylent green is made of people! You've got to tell them! 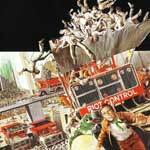 Soylent green is people!" i don't know if i can even be your friend anymore. I just spewed Soylent Green all over my keyboard...wait you turned down the Bass? You wuss...maybe you are not the man to help complete the Bass Cab I have lovingly dubbed "Monolith." now..i may be going against the grain here, but what i think you have experienced, sam, is a natural maturation of music listening skill. who says all albums are mixed equal??? its been part of your life long evolution to fine tune your music listening skills and adjust for maximum enjoyment.